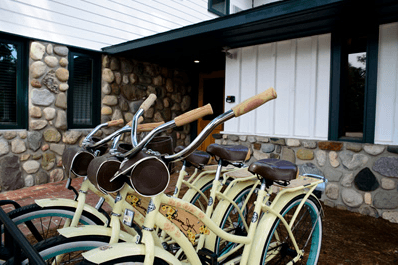 Enter here for your chance to win a vacation at the Leland Lodge in stunning Leland, Michigan! To enter for your chance at a vacation in Northern Michigan, please fill out the form below. As a benefit of your entry you will receive our e-newsletters: MyNorth Food & Drink; Getting Up North; MyNorth Style, MyNorth TicketWire and MyNorth Outdoors. You may subscribe to any or all of these, or unsubscribe at any time. Nestled in the pine trees and a stone’s throw from the lake, the Leland Lodge offers a quintessential Northern Michigan experience. Step out the door to the beautiful Leland Country Club where you can enjoy 18 holes of golf. Then hop on a stylish bike to cruise around downtown Leland where the character and charm of Fishtown — a set of preserved historic fishing shanties that are now home to boutiques — define lasting memories. 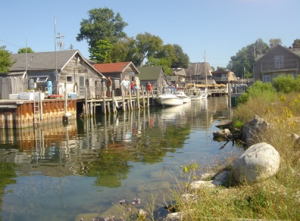 The Leland port lures Great Lakes sailors and boaters all summer long. Catching the crowded harbor on a warm summer evening is a memorable experience. Leland is also homeport to the ferries that take visitors to the Manitou Islands, apart of the Sleeping Bear Dunes National Lakeshore–voted Most Beautiful Place in America by the viewers of Good Morning America. Leland is located on the lovely Leelanau Peninsula, which is one of America’s premier fruit growing regions and a rapidly growing wine country. Can’t wait to win? Enjoy all that the Leland Lodge offers this summer and make your reservation now!